Welcome! - Welcome to the PQ Wiki! Welcome to the PQ Wiki! Hello! You are at the PseudoQuest (PQ) Wiki. We are still under construction, but the game itself isn't. Please go to PseudoQuest.com and sign up today! Note: Item prices have been changed, so they need an update. Graphics have also been updated, an can be mapped now. Some new areas were released, so those need to be mapped as well. We also need to cover the Dojo. If you feel helpful today, why not edit something yourself? 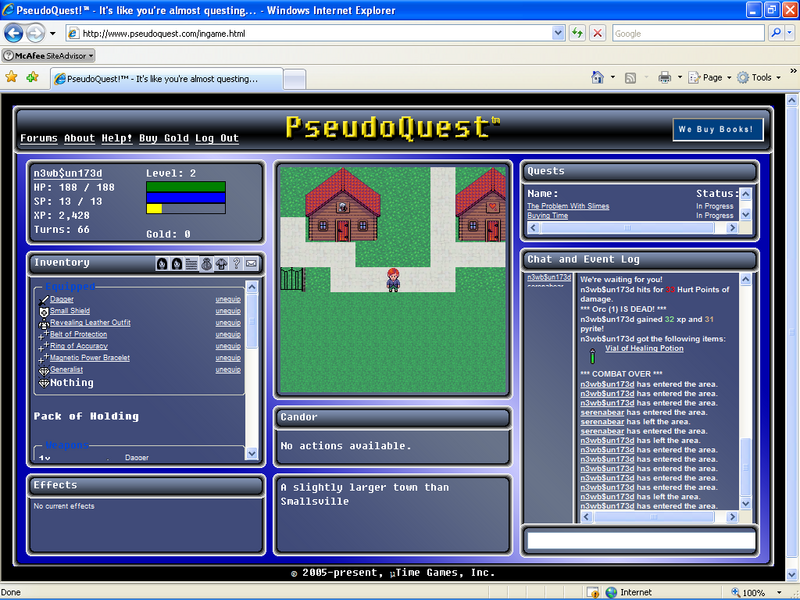 PseudoQuest is a whimsical web game set in your more-or-less typical fantasy setting. Well, typical for the fantasy genre - not that it's necessarily your fantasy. But I digress… The game is free to play forever…meaning you will never be required to break out your wallet to play! (of course, you'll have to provide your own connection to it ^^) There is no downloading of any software needed, and requires no special plugins for your browser of choice. Be aware though, that with so many browsers around, the unique CSS used for the game can often cause problems in some browsers. Be sure to inform of these issues on the forums. The preferred browser for PseudoQuest is Opera, due to its high level of CSS compliance for precisely this reason. However, any up-to-date modern web browser should be capable of playing the game. Read up on the History of PseudoQuest on the History page. The world is constantly in growth! Things will change constantly, but most of the content that is already implemented will stay as such. Any addition to the game created by Xaroth (the owner of PseudoQuest) can be done fairly quickly, and with minimal impact to the over-world's layout. The locations of things already in game will not move, only new content will be added as needed. This means that if you start playing now, and learn the entire layout of the world, once new content is put in, those locations of towns and dungeons that you knew about before will still be in the same place. During the limited beta, two new areas were added seemlessly, and just required finding where it was placed in at (although it was noted in the forums as to where it was located at). When in a hostile area outside of town, the player will randomly encounter monsters. The combat system is fairly simple. To attack a monster, all the player must do is click the attack button next to it's name. The player is also given the options to flee or to wait a turn, or can use an item from the inventory screen. In PQ, Skills can be obtained by getting a skillgem. Skillgems cost EXP to equip, but once equipped, the player learns skills depending on his/her level. These skills can range from stat enhancing "buffs", to skills that can harm monsters in combat. Players can constantly "IM" each other through the game's chat system. You can chat with other players as long as they are online and in the same area. The game's "Post Office" is used to send private messages to other members, who do not necessarily have to be online. In addition, there are Player-Owned Shops from which a player can sell anything that he/she has obtained, at prices the player selects.